Enormous, wedge shaped Fullers pub right opposite Lambeth North tube. 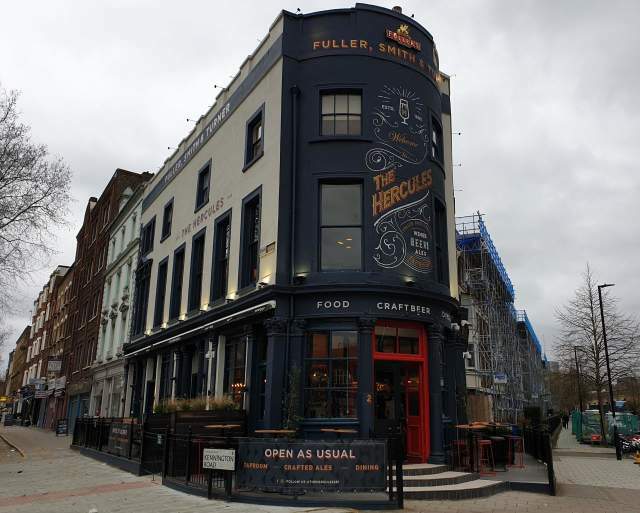 This newly – and beautifully - refurbished pub is the latest from Fullers to carry a range of high quality keg beers from other breweries alongside its own cask range. Its ‘craft beer tap room’ (essentially just the downstairs bar, as far as I could tell) offers 19 keg lines and 5 cask beers (served in excellent condition). There’s another sizeable room upstairs (with its own bar, but serving some of the same beers), which also houses a shuffleboard table. This is a stunning building and a lovely pub.